In Southern California the changing of the seasons is most recognizable by the revolving myriad of fresh produce available at the farmers’ market. Yes its colder, and even rained a few days recently, but that’s about as much winter as we can expect to experience in Los Angeles. More notably citrus season. Many citrus trees are heavy now with fruit. My neighbor has orange, grapefruit, kumquat, Clementine and blood orange trees. Soon enough the special varieties found at the market will be gone. Which is why now is the best time to preserve the perfect organic citrus that is still available. I was fortunate enough to be on the receiving end of a bounty of homegrown lemons. 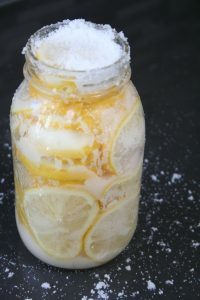 Preserved lemons are great because they are so versatile. 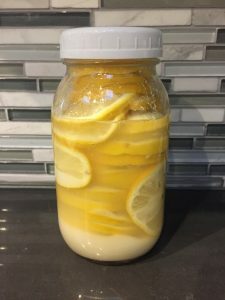 Any savory dish that you would usually add lemon juice to (think dressings, salads, grain bowls, pasta, chicken…), you can add preserved lemons to instead. So why bother? Instead of using the juice, once the lemons are preserved you can use the whole peel and it gives dishes a richer, deeper lemon flavor. Because you are going to be eating the peel of the lemons, or limes, they should be organic. Cleanliness is extremely important when preserving any food. Jars should be sanitized, workspace and utensils thoroughly washed before prep, and wear disposable gloves. If you have even the tiniest cut, the last thing you want to do is cover it in salt AND lemon juice. 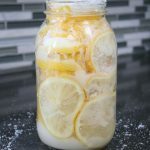 If you are looking for ways to use the lemons, they can be used in place of lemon juice in Roasted Garlic Hummus, or added to Moroccan Salmon. This Bon Appetite recipe for Strozzapreti (pasta) with Spinach uses preserved lemons too. And if you need another reason to purchase a copy of Balaboosta or Plenty More, both books have a few recipes such as Seared Snapper with Red Pepper Lemon Sauce and Preserved Lemon Mayonnaise that use preserved lemons. Once you’ve taken the time to make them (it really only takes about 20 minutes), by the time they are preserved you are going to have more uses for them then you know what to do with. Salt magically preserves lemons and makes the peel an edible delicacy. 1) Bring a large pot of water to a boil. 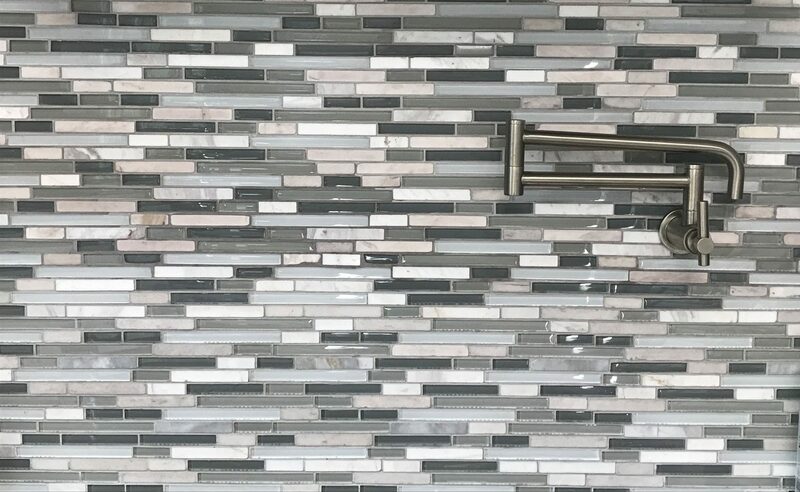 Submerge the glass jar in the boiling water for 5-10 minutes to sanitize. Remove the pot from the heat and allow jar to cool. 2) Wash lemons with a few drops of produce wash and a scrub brush. Place washed lemons on a clean surface on paper towels and allow to dry. 3) Prepare prep area by placing salt in a bowl. Put on disposable gloves and slice lemons 1/4 in. thick. 4) Take lemon slices one at a time and coat either side with salt. Layer slices in sanitized jar. Repeat until the jar is packed full with slices. 5) Top jar with additional salt a close with a lid. 6) Allow lemons to preserve at room temperature for one month. After one month lemons are ready to be used. Store preserved lemons in the fridge for future use. 7) When ready to use, remove desired amount from jar and rinse. Discard lemon fruit and use peel.